The picture was taken shortly after the Georgia Lee as launched at Howard Shipyards Jeffersonville Ind. She was called Silk Stocking by her crew because of her elegant furnishings. Later she sank while being relaunched at a Paducah Kentucky repair facility when she broke her chains and plunged uncontrollably into the Ohio River. Capt. Peters Lee rushed back from India where he was travelling when he learned of her sinking. 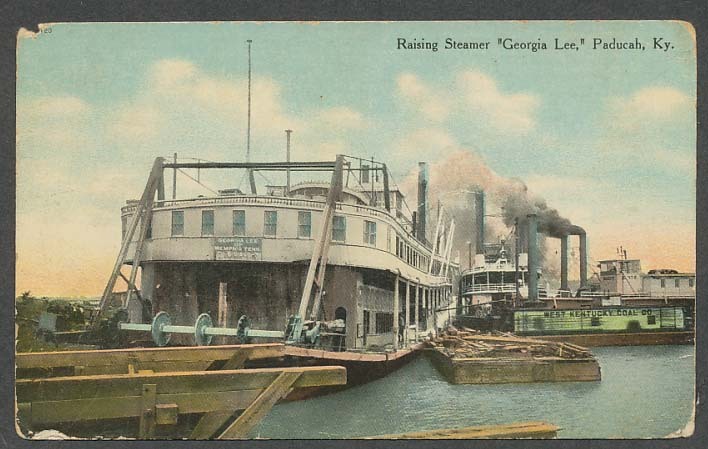 The postcard below pictures the Georgia Lee after she had been refloated.